Its time to introduce my forthcoming game, Toxin! It’s my first game since 2003, and has been in development for erm, *too long*. I can’t give a release date yet; every day I sit down and say, “this week I’m going to finish it”, but most of the code and artwork is complete. There are some cosmetic changes I want to make, so please bear in mind that these screenshots might not reflect the finished product. 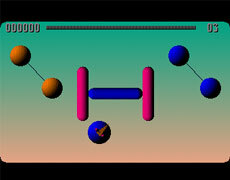 Toxin is an abstract puzzle/shooter for the iPhone and iPod Touch, running on iOS3.0 and above. 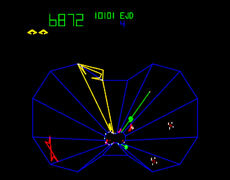 The basic gameplay is simple. 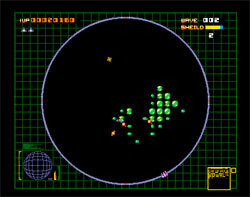 You control a ship that rotates around the edge of an elliptical playfield, shooting inwards. If anything touches the edge you lose energy. Lose too much energy and you die. 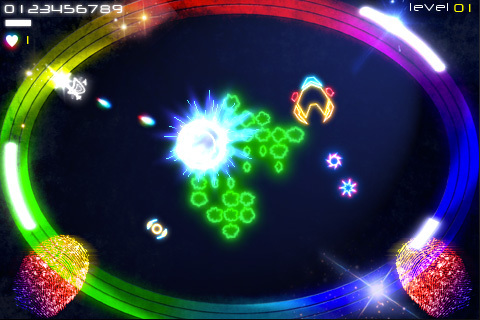 Inside the ellipse are 99 levels of swarming biological foes, multiplying toxic cells, physics puzzles and colourful particle effects. 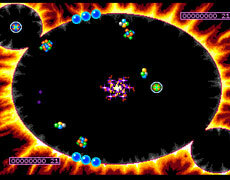 Toxin was inspired by a number of different games including Geometry Wars, Tempest, Space Invaders and Ebonstar, but the biggest influence was Microbes, released by Vision Software in 1991. 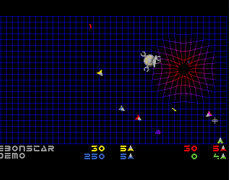 I really enjoyed this back in the day, and like many innovative Amiga titles it seems to have disappeared from the consensual history of video games. You can play it with UAE, but I dont think the emulation is perfect. 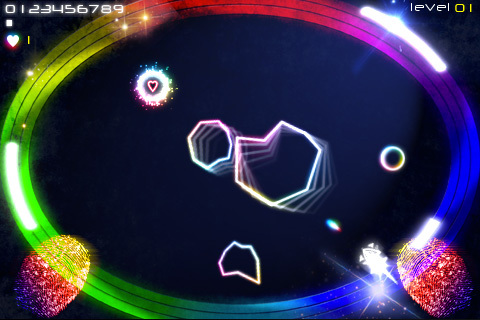 Once this game is done, I am thinking about writing a Toxin “Remix” called Antigen. It will have the same ship-in-an-ellipse structure but the core game will be more puzzle based and slower paced as well as having different artwork. I think the idea of a game remix could work well at low pricepoints, a little like the way remix CDs used to accompany singles.